Technology has sure changed the way dairy cows are milked. Modern farms are equipped with one or more robotic milking systems. This allows the cows to be milked as it desires. When a cow wishes to be milked, it walks into the robot. It’s an area, just large enough for the cow to stand in. You can see it in the image below. The doors you see are the exit doors, it walks in from the other side. This is what the actual robot looks like. It’s behind the red area you see in the picture above. Here is a cow that walked into the robot while we were there. Do you see the collar around the cows neck? It’s called a transponder tag. It identifies each cow, so when this cow walked in, the robot determined it had already been milked and promptly opened up the exit doors letting the cow walk right back out. The cow gets a yummy treat when it’s milked in the robot, perhaps that’s why this cow tried to get milked again. Another cow walked in needing to be milked. 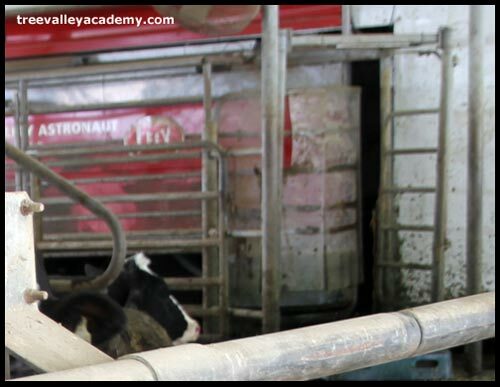 The robot knows the exact position of the teats for each cow and quickly locates them with a help of a laser. It uses a brush to clean and disinfects each teat. Then it attaches the milking device to each teat, and begins to milk. 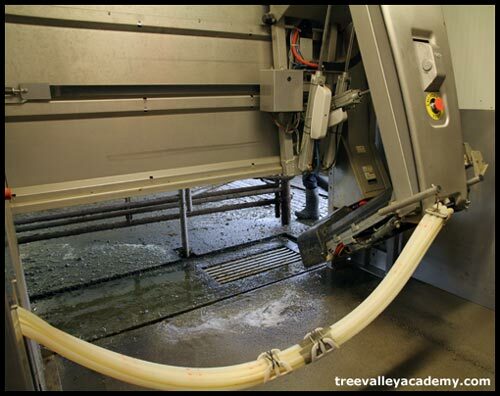 When the robot detects that one of the quarters of the cows udder no longer has any milk, it automatically detaches off that teat. …to a container that collects the milk. That milk is then sent through pipes into a much bigger milk tank, called the bulk tank. The milk is refrigerated in the tank to keep it cool. In Canada, it’s forbidden to mix milk from a cow on antibiotics together with the milk from the rest of the herd. So, the robot automatically puts the milk from a sick cow into a separate collection area which will be discarded. Also if the robot detects blood in the milk, it will also divert that milk. 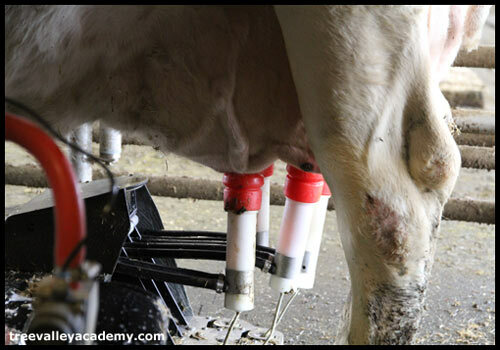 There are many benefits for the farmer to use a robotic milking system. For one, the robot saves the farmer labor costs as the cows largely are able to milk themselves. Also, when the farmer goes into the barn, he can see a lot of data about each individual cow on a computer screen. He’ll be able to see how much the cow weighs; how many times and when it had been milked; how much milk the cow gave and broken down by each quarter of the udder, and much more. He can use that data to help detect which cows need extra care, and if there are cows that didn’t get milked enough, he can then make sure that they do. 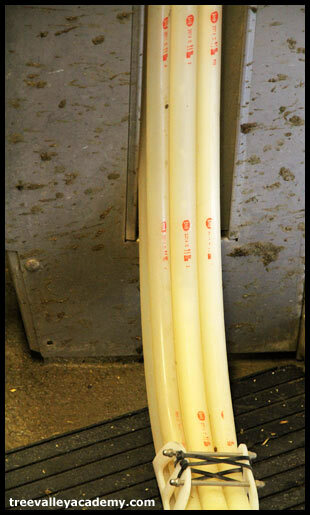 Every day or so, a milk truck goes to the farm, and with a hose, pumps all the milk from the milks bulk tank to the truck. The driver might pick up milk from a few farms before bringing it to a processing plant. There the milk is prepared, pasteurized and packaged before being sent to the stores for us to buy. What’s a visit to a dairy farm without seeing the baby calfs. Wow! Technology is amazing! Thanks for linking up at the Thoughtful Spot Weekly Blog Hop! We hope you join us again this week!